Retired professional basketball player and former CBA, WNBA, and NBA head coach, Dave Cowens, and CEO of Northeast Delta Dental, Tom Raffio combined business smarts and basketball strategy in their debut business book There Are No Do-Overs: The Big Red Factors for Sustaining a Business Long Term. 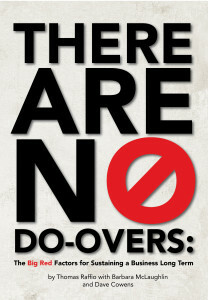 There Are No Do-Overs is a game-changing management book that offers readers insight on how to create a winning team at the office by reviewing lessons from the basketball court. Think of it as a full-court press that shows business leaders how to bring their A game—from tip-off to working overtime—and what it takes to win. Combining lessons from the boardroom with directives on how to make big wins in the NBA, There Are No Do-Overs shows readers the devil is in the details. In other words: success is the sum of paying attention to detail when it comes to business, sports, and life. “There Are No Do-Overs: The Big Red Factors for Sustaining a Business Long Term displays the importance of success in the business world, combining business and basketball to create a slam dunk read. Raffio, McLaughlin and Cowens prove that you can shine on and off the court,” says Jack Heath, host of New Hampshire Today and author of Salem VI: Rebecca’s Rising. Tom Raffio, CEO of Northeast Delta Dental, was born and raised in Weston, Massachusetts. He graduated from Harvard University in 1978 and earned his Masters at Babson College in 1988. After college, he began his career at John Hancock. Ten years later he was hired at Delta Dental Plan of Massachusetts to start up the operations, and he worked his way up to Senior Vice President after ten years service. In 1995, he moved to New Hampshire to become President and CEO of Northeast Delta Dental. He founded the Northeast Delta Dental Foundation in 1997. He has served on over 20 not-for-profit boards and advisory councils. He and his lovely wife Lisa live in Bow, NH and raised twin sons and two daughters, all of whom are in or graduated from college. He enjoys road races and skiing in his spare time. Barbara McLaughlin, retired Director of Corporate Relations at Northeast Delta Dental, was born in Pennsylvania and raised on the North Shore of Boston. After receiving her Bachelor of Science degree in Education from Salem State University, she married her high school sweetheart in 1977. She taught elementary school and junior high art for a number of years before beginning her career in the Office of the President at Northeast Delta Dental in 1987. She was recognized as a Far Exceeds employee every year for ten years before being placed in the Hall Of Fame. Barbara was appointed by the President of the United States to serve on the Selective Service System (SSS) board – the third line of defense for the United States, behind only the active military and the National Guard, and she has been Chair of the SSS Hillsborough County Board since 1999. She enjoys her hunter-jumper trained horse, the great outdoors and anything to do with nature, and riding her Harley Davidson with family and friends. Dave Cowens is a retired professional basketball player and former CBA, WNBA, and NBA head coach. He was the Athletic Director of Regis College for two years, and he was one of five founders of the National Basketball Retired Players Association. For 40 years, he conducted overnight basketball camps in the Greater Boston area attended by approximately 40,000 kids ages 10-17, and he conducted clinics in other U.S. cities, Asia, and Europe. Dave was Chairman of the Board and Executive Director of the Sports Museum of New England for 10 years where he managed, promoted, and raised funds for its educational programs. His civic involvement includes serving as the honorary chairman of many medical and social charitable organizations on a local and national level, and he served on the boards of Wheaton College and the Olympic Bank of Boston, each for five years. Dave fought to preserve and restore the Prowse Farm in Canton, Massachusetts, located at the foot of the Blue Hills on a natural aquifer and the site of Doty’s Tavern, a place where patriots drafted portions of the Declaration of Independence that were delivered by Paul Revere. It was also the breeding site of some of the most famous standard bred horses in the world. His many interests and roles include small businessman, product endorser, author, public speaker, gardener, golfer, husband of 35 years, father of two daughters, and friend. There Are No Do-Overs: The Big Red Factors for Sustaining a Business Long Term is available at Amazon, Barnesandnoble.com and a variety of local retailers. To learn more about the books go to www.bigredfactors.com.